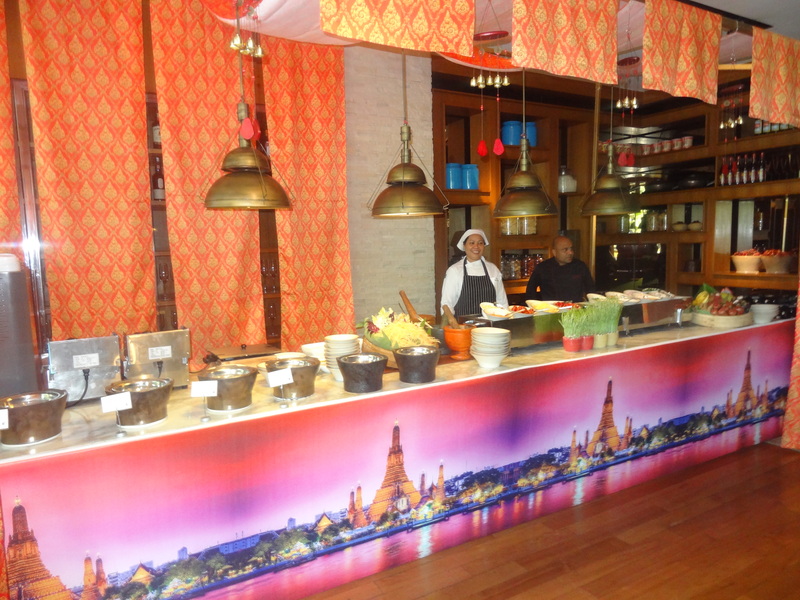 K3 is hosting Chef Kluaywan Junsawat, aka Chef Kung, Thai Chef at Courtyard by Marriott, Mumbai International Airport to bring the flavours of Bangkok’s street food to New Delhi. 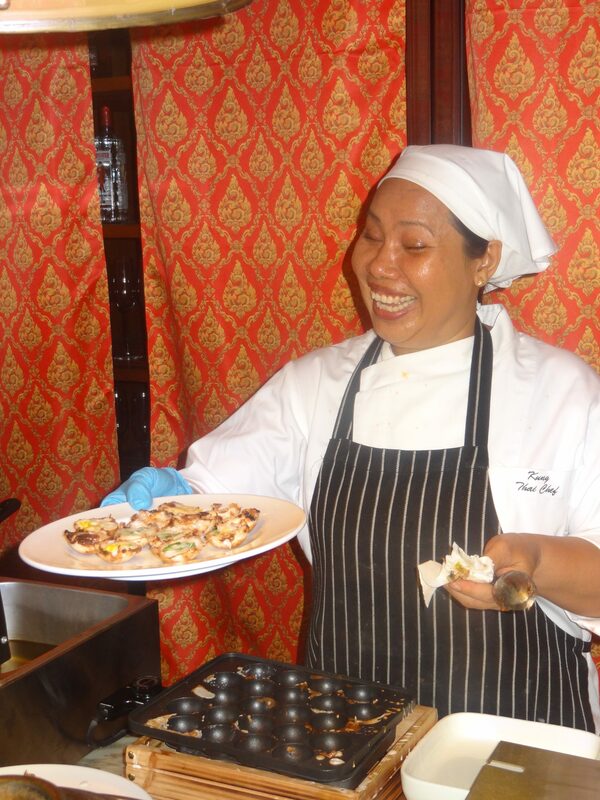 During the festival, Chef Kung’s kitchen in New Delhi had dished up signature dishes such as Kratong Thong (Thai rice and coconut pancake), Geang Kiee Wan Kai (Thai Chicken Green Curry), Pla Neung Manao (Steamed Seabass), Som Tem (Papaya Salad) among others. Now let me start with what I had for drinks there. 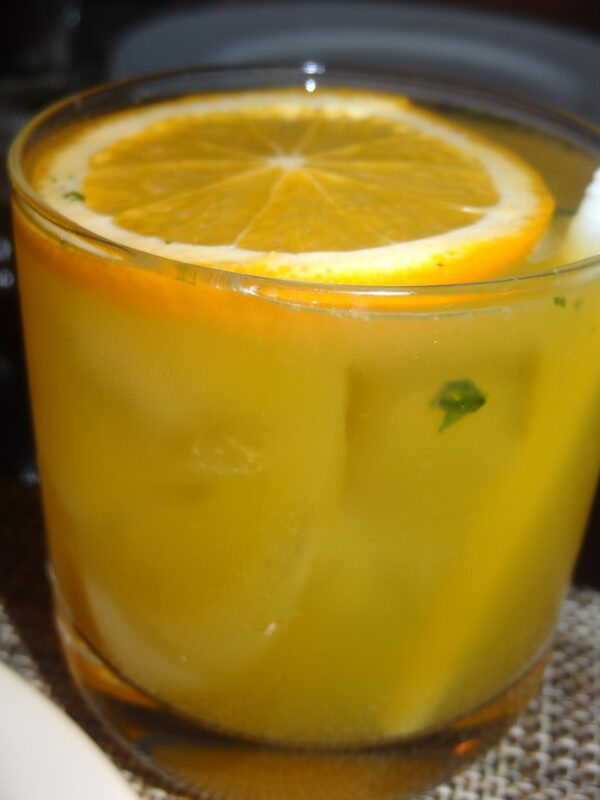 I tried the mocktail Swarna consisting of orange juice, basil & lemonade served with a slice of fresh orange with lots of ice to chill and begin the hot afternoon. 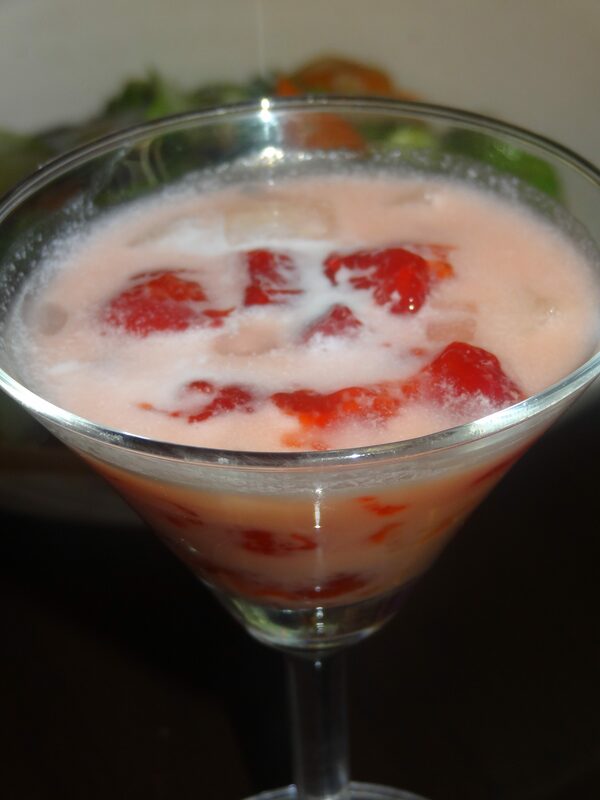 A refreshing, cool & an excellent start to a healthy meal to follow. 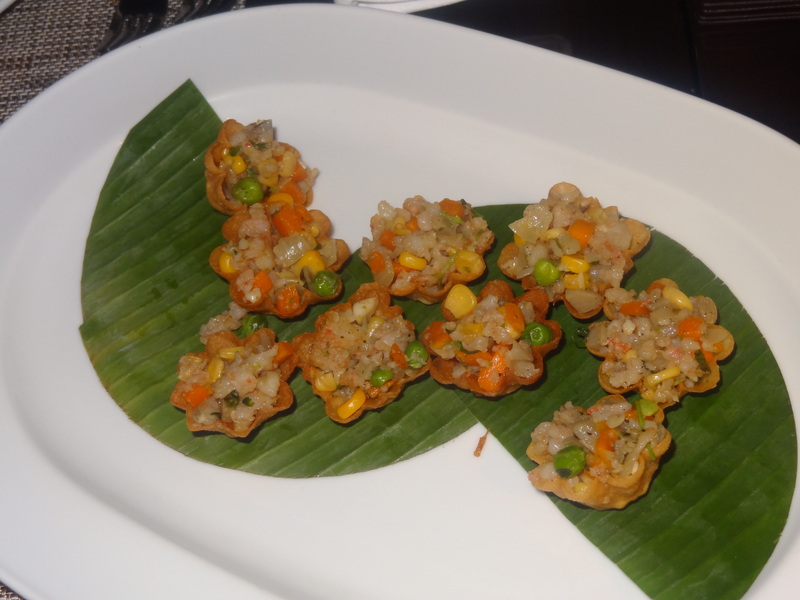 For the appetizers, we started with the appetizer, Krathong Thong– deep fried crispy cupcakes which were yummy & made crisp with fine veggies. I loved the crispy cupcake form (a crispy, nice, outer coating is what I loved munching on) making it a great start. 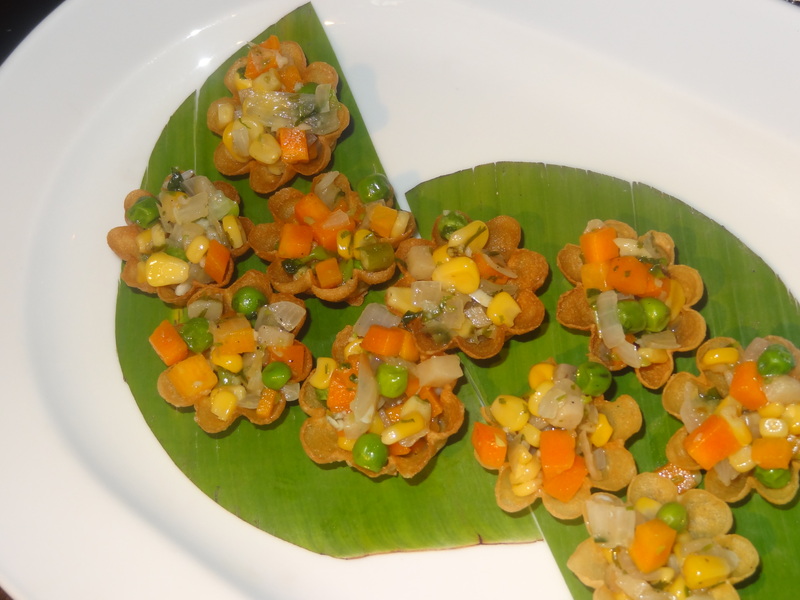 The Thord- Mum Pla (deep fried fish cake) consisted of carrots, fish & corn. A thorough delight again! 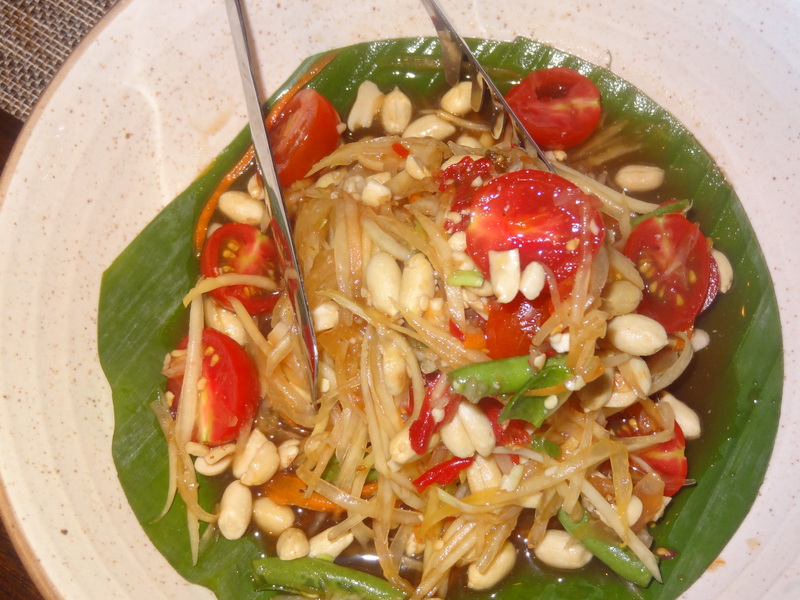 The Som-Tam (Raw papaya salad) had papaya cut in juicy julienne with groundnuts, beans & the juicy cherry tomatoes. A fresh & tangy salad. I can have this anytime. 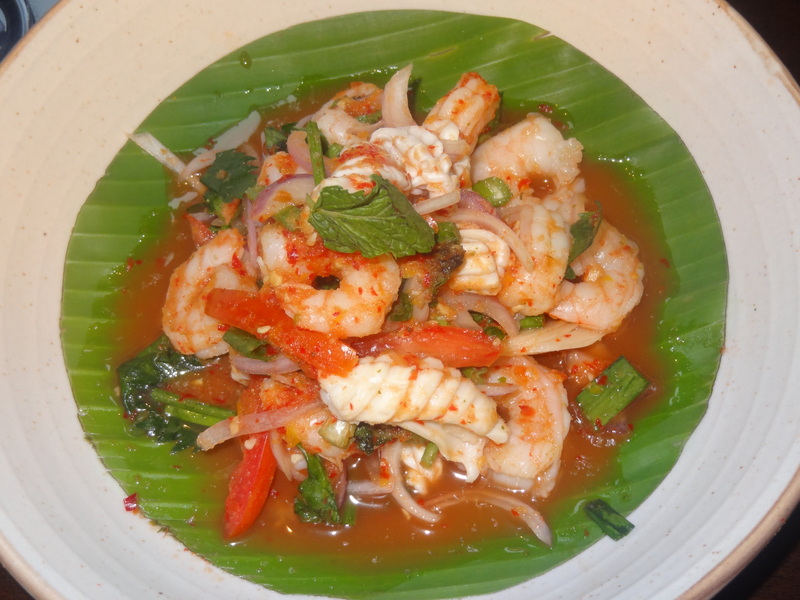 There was Yam Thalaya also on the menu- a spicy mixed seafood salad which I couldn’t try due to my allergy to sea food but heard great reviews about it. The Tom-Yum Phak soup was a spicy vegetable soup with lemongrass, mushrooms, broccoli & corn. It tasted nice but a little spicy and leaving a fresh aroma & aftertaste. 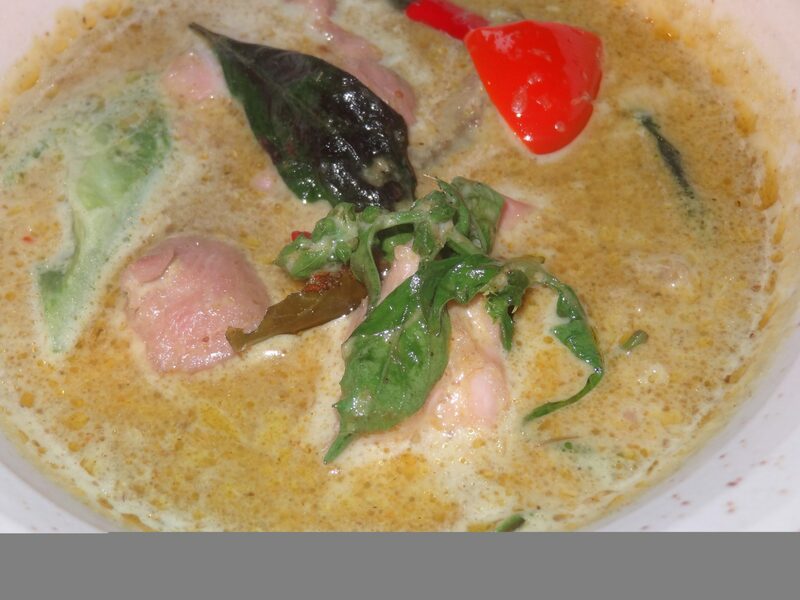 Coming to the main course, first was Geang Kiee Wan Kai (chicken in green curry). It was nice, mildly spiced and tasted great. 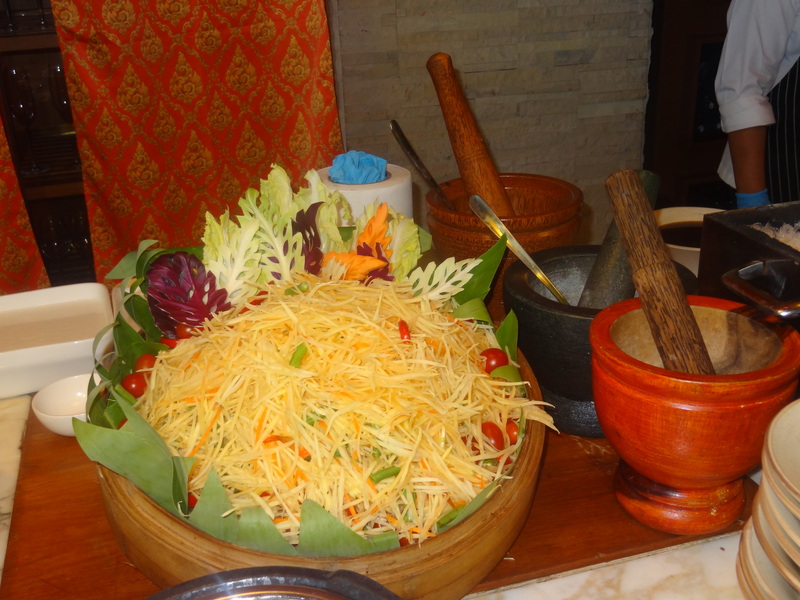 It was a total Thai delicacy with rich Thai flavours & aroma. 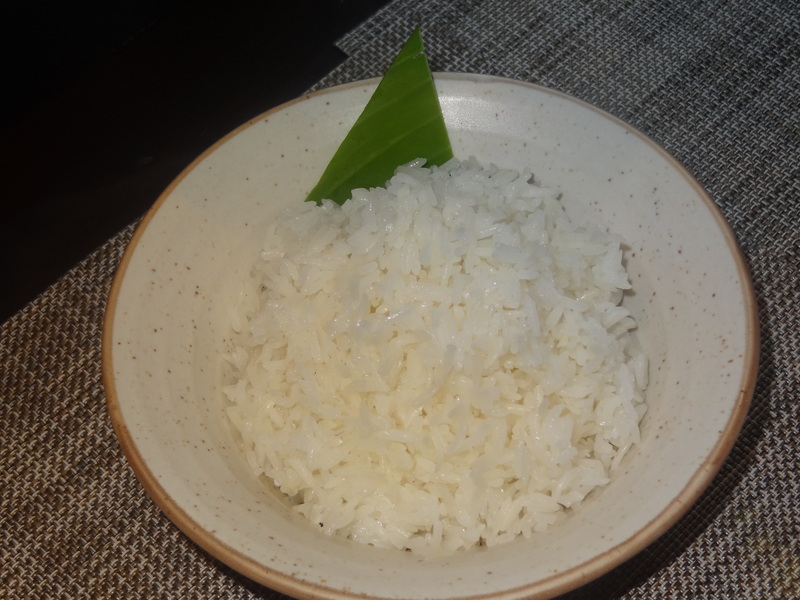 I had it along with the Steamed Rice blending well with the Thai touch of flavours in the dish. 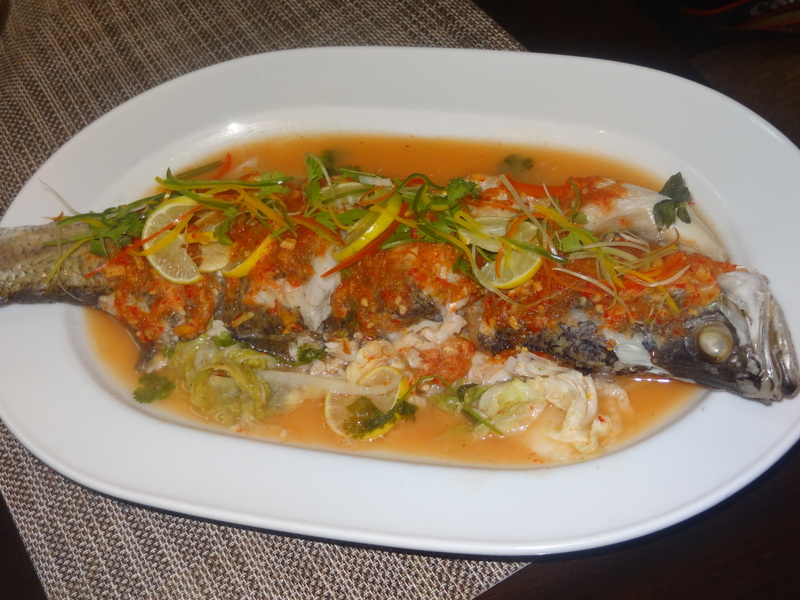 The Pla Neung Manao (steamed fish chilli lemon) was well-made tenderly cooked fish by the talented chef with the juicy flavours and sauces. 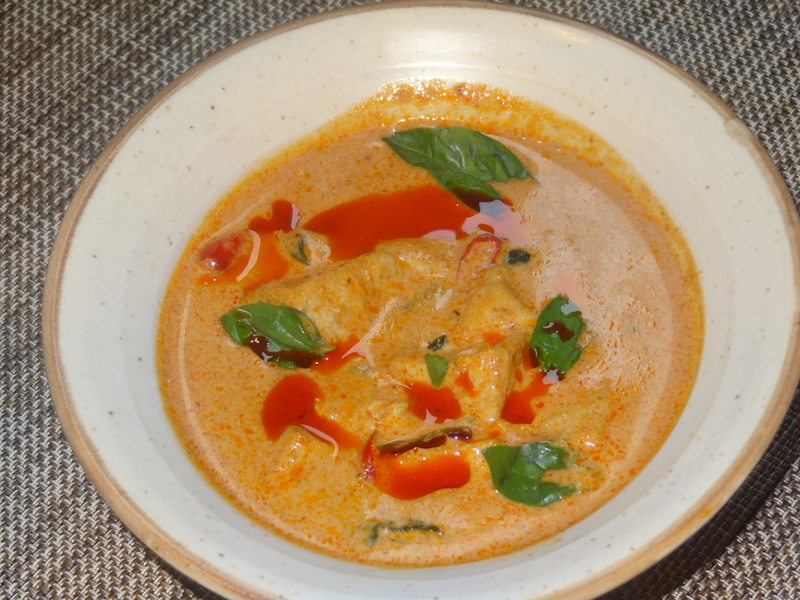 The Panang-Tow-Hoo (quick tofu in red curry) had soft tofu well made in the flavourful thick gravy. 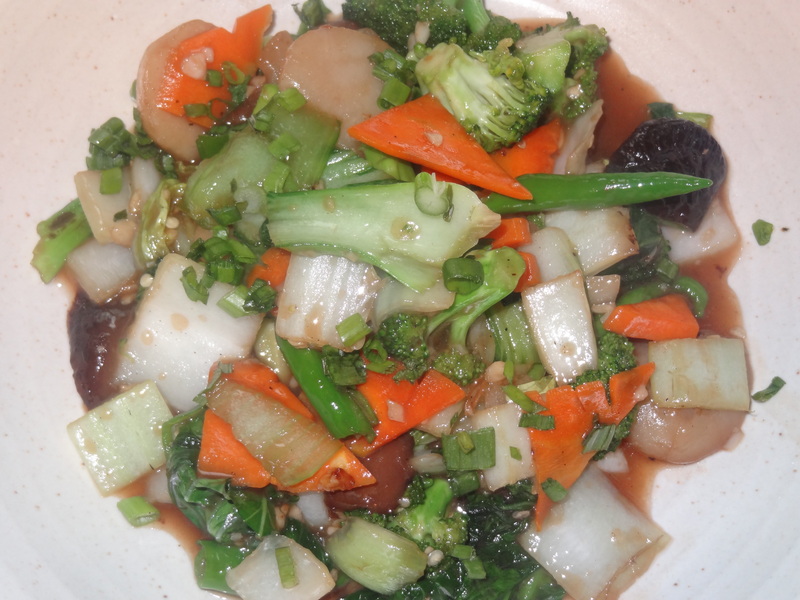 The Phad Phak Ruam (stir fried mixed vegetables in light soy sauce) was nice & blended well with the fresh aromatic green veggies tossed together. Has to be my favourite from the menu! Coming to the desserts, I tried the Thab Thim Grob (water chestnuts with coconut syrup) giving a very sweet & delicious end to the lunch. I thoroughly enjoyed each & every dish for the flavours were great and the delicacies were lovely and the love & hospitality they were served with was out of the world so without second thoughts, JW Marriott stands apart from the crowd delivering to the taste of people’s likings. Do not miss the Bangkok Street Food Festival. It’s on till 7th May, 2016 and is priced at INR 2200++ INR 2650++ for dinner & lunch buffet respectively on a rotational menu everyday. It’s a must try!